Hex Inserts are made from Free Machining, Free Cutting, Leaded Brass, 300 Series Stainless Steel or Aluminium which are Passivated and Tested to ASTM Standard. 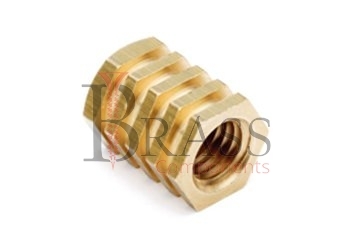 Hexagon Inserts are available in any metric or imperial sizes as per custom specification. Hex Inserts provide High tensile strength, excellent resistance to corrosion and good electrical conductivity. Hex Inserts specified with generous hex sizes and deep grooves to cope with high torque levels during assembly and use. Flanged Hex Drive Types have a weight-bearing lip, or flange along the top of the Hex insert to anchor it in place. A PVC foam seal is bonded to the underside of the head and when installed provides a weather-tight seal. Hex Inserts designed to reduce installation forces into harder materials. Hexagon Inserts provide exceptional holding power in materials. When installed into a corresponding hex hole, the radius corners of the Hex Insert expand and fill the hole. Avoid Stress Fractures of material and prolong punch and die life by specifying a radius corner in Hex Hole. Superior Thread Strength is provided due to internal rolled thread manufacturing process. Superior Corrosion Resistance is provided by standard zinc/yellow finish. Hex Inserts meet RoHS Requirement and UL Listed. Hex Inserts used on steel for decorative purposes and to resist corrosion. Ideal solution for any application where assembly or disassembly could lead to thread erosion or stripping. For use with mating thread-locking fasteners. We manufacture Hex Inserts as per Custom Specification and export in Germany, Spain, Netherlands, Portugal, UK and other European Countries. For more Information, Please Contact Us or Inquiry Now.